NIA CHARLESTOWN NEVIS (August 27, 2014) — Deputy Premier of Nevis Hon. 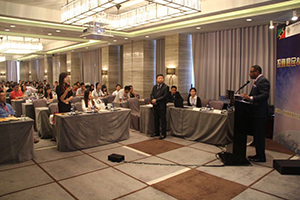 Mark Brantley, described Chinese willingness to invest outside of their homeland, as amazing and encouraging. His comment came when he updated the Department of Information on August 25, 2014, on the progress of his trip to Asia, where he has been meeting with potential investors for St. Kitts and Nevis, in particular Nevis. “The appetite for investment here by the Chinese, both on the mainland and in Hong Kong, is simply amazing. Their interest in looking outside their country and to invest in the Caribbean and in St. Kitts and Nevis in particular is quite instructive and quite encouraging. “They have, of course, large amounts of money to invest and they have a willingness to come out and to see what we have to offer,” he said. Mr. Brantley who is also the Tourism Minister in the Nevis Island Administration (NIA) added that he was pleased to extend an invitation to visit Nevis to persons he had met during his trip. “As Minister of Tourism, it has given me tremendous pleasure to invite them to come all this way to visit us in the Caribbean and to visit us in Nevis. “They are particularly impressed to hear about our cuisine, to hear about our culture, to hear about our golf, fishing and all the amenities that we offer and so we certainly look forward to this continuing to play out,” he said. 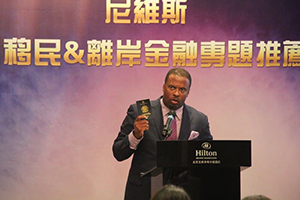 On his visit to Asia which was facilitated by some Chinese investors who were keen on attracting investors from that part of the world to Nevis, Mr. Brantley was slated to hold meetings with potential investors in Hong Kong, Beijing and Shanghai. The Minister also expressed the view that the NIA continued to live up to its commitment to the people of Nevis and would continue to do so. “We believe that this Administration has made a concrete commitment to the people of Nevis to attract investors to our shores and we shall continue in that vein in the capitals of the world,” he said.